Hi Brad! Now that KFS has posted their statement yes, the Spider-Man strip as we know it has come to an end. And as much as Roy Thomas and I were hoping that the strip would go on to continue Stan Lee’s legacy just as King Features did with The Phantom after Lee Falk died 20 years ago, that’s not the case here. March 23 will be the last Daily and March 17 will be the last Sunday as we close out the current storyline. It’s news to me that in the statement it mentioned a new strip starting up possibly months down the road after they reprint some classic Lee-Romita stories from 40 years ago or 30 years ago whichever they choose! A strip further exploring the Marvel universe as they say which doesn’t mean it would or wouldn’t be Spider-Man and if they were going to feature new creators or if they would call on Roy and me again to create stories in any universe they desire us to go. Time will tell but in the meantime it was glorious fun while it lasted and I learned a huge lesson about not counting any chickens before they hatch. It was difficult inking and sending in my last week of Dailies a few weekends ago (the Sundays were always done 3 months ahead of time so I hadn’t drawn one of those in months ). It was like saying goodbye to my old friend all over again. One thing fans liked about the strip is something Thomas prided himself on: its continuity with the origin story of the comic books, and the continuation of Peter Parker's life cycle. Though Spider-Man: Into the Spider-Verse has irrevocably proven how much fun there is in the multiple Spider-Man timelines, the comic strip was a nice place to visit for old-school elements, like, for instance, the Peter Parker/ MJ romance. So while Peter Parker may be currently sort of dead in the MCU, he's still alive and well and living in an apartment in Manhattan with MJ in the strip, at least he will be until this Friday. Yep, I have no doubt that was a welcome element for many fans driven away by Joe Quesada's loathsome One More Day atrocity. The fact Mary Jane was still allowed to be the lady Lee created her to be - married to Peter Parker - was certainly a plus. Even so, what Quesada did is something Spidey's never recovered from in the long run. When Thomas got news of the strip's upcoming demise, he had been plotting out a trip to Australia for Parker and MJ, where they were to encounter the villain Kangaroo and have various exploits and adventures. "Marvel decided to kill the strip," says Thomas, "and not print the final couple of weeks. And [artist] Alex Saviuk graciously reworked the final strip to show the two of us in it, and to add a 'Nuff Said!' headline on the Daily Bugle." Was that Quesada, C.B. Cebulski or Dan Buckley who made the decision? I don't know, it all depends on who's in charge, but if they were behind it, they decidedly did wrong. That's not saying I believe the strip had to continue at all costs - I do think it wore out its welcome long ago. But when such pretentious men are in charge, I can't help feel they had it canned for unaltruistic reasons. Even though Mary Jane's since been restored to Spidey's comics. Artistically speaking though, I do think the newspaper strip lost its way somewhere by the mid-2000s, recalling a story from nearly a decade ago where Sabretooth turned up looking for Wolverine (who made an appearance several weeks prior to that one), and Victor Creed's idea of how to find Logan was to terrorize Spidey, which made no sense. Sabretooth even went so far as to track Peter and MJ on an assignment to Florida, and at one point, threatened to cut MJ to ribbons if that's what it took to find out where Wolverine was. Logan arrived just in time, they had a duke-out, and, IIRC, both conked out and later left off-screen. What irritated me about that storyline in hindsight was that here, Sabretooth put MJ's life in danger, and Spidey doesn't actually try to ram him for endangering his girl Friday? It just reeked of plain bad writing, is all. A better idea would've been to have Spidey finally throw off the kid gloves and smash Creed with all his might, telling Wolverine that this is his fight now and insist he wait in line. It almost made the time Peter assaulted Ben Reilly and accidentally struck MJ during the Clone Saga look tame by comparison. I don't know if Thomas was behind that particular story, but I do know it insulted my intellect so badly, I was discouraged from reading it again for a long time. So I'm not really that sad to see the newspaper strip put to rest after 4-plus decades. I guess I'm just sorry if it lost direction, which would dampen any positive impact during its close, and also sorry if Marvel's upper echelons had it canceled for biased reasons. 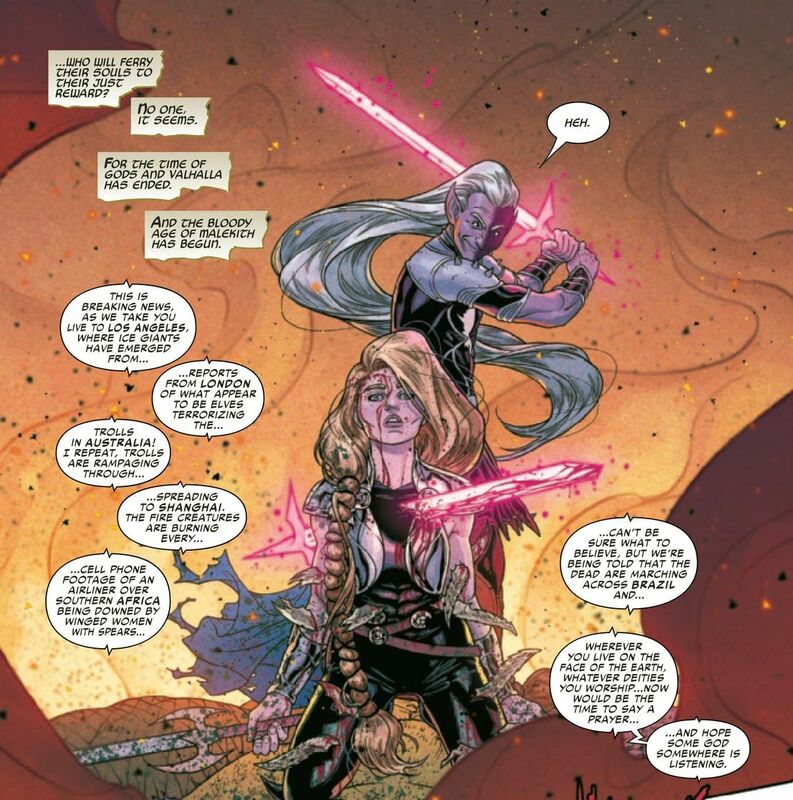 The Asgardian warrior Valkyrie may have met her demise at the hands of the Dark Elf Malekith in War of the Realms #2, but that won't be the end of her story. Marvel Comics announced a new Valkyrie ongoing series by writers Jason Aaron and Al Ewing at C2E2 in Chicago, and now we know who will be starring in the title role: the former Mighty Thor, Jane Foster. Joining Aaron and Ewing on Valkyrie is artist Cafu. And even though Jane Foster will be the star of the series, it doesn't mean fans have heard the last from Brunhilde. It makes no difference. They're doing this under the presumed confidence less will complain since this time, Jane's been put into role filled by a lady rather than a man. But when it's all tied so obviously to such a cynical company wide crossover, that's why it's only forced and contrived for the sake of cheap pandering. "It's not like the old Valkyrie. Brunhilde is available for consultation occasionally, but she no longer belongs to the world of the living -- so Jane's mostly on her own," Ewing told Marvel.com about how Jane's tenure as Valkyrie will differ from Brunhilde. "That said, she does have something not seen before in the world of Asgard -- UNDRJARN THE ALL-WEAPON, forged in the fires of the Realm-War, that can change its shape and be whatever the wielder needs -- including wings! Which doesn't necessarily mean no more flying horse, but I'm getting ahead of myself..."
No, Ewing's way behind. This is another rock bottom gimmick nobody likes anymore, as the reception of DC's Heroes in Crisis should also make clear. And they've already revealed Brunhilde is going to be turning up again...as a ghost, what else? In the end, given the contemptuous way they went about all this in the past several years, that's why it's just too late to make Jane a deity of any sort. It's just a superfluous attempt to compensate for all the trouble Marvel caused when Axel Alonso was EIC, and now C.B Cebulski's only blowing things just as much, mainly by tying it all to a crossover instead of confining it to a single, stand-alone book or miniseries. Also, I doubt many of the SJWs they're pandering to intend to buy and read the solo book they're launching. If they didn't give female Thor financial support, they're not bound to support the Valkyrie book either. But that's just a small sampling of how ludicrous Waid's turned out to be in this whole affair. Here's a PDF of the available court deposition, where Waid uses some stupefying language (he calls his supporters "hordes of hell"?!? What was he thinking?) And he even admits he hates conservatives. Very telling. After checking some of this, all I can say is, Waid's had it in this business. It's time he took a pension and just retired to some suburb where he can write his career biography (not that I'd expect it to be honest or sane, though). It's bound to become a classic case of somebody who was once on top, and plummeted to bottom. Well that's because of something this NYT article doesn't actually mention: horrible story quality discouraging the younger generations from reading various comics at all. Still, if pamphlets are what they're referring to, that's something quite a few retailers don't seem to accept is killing the business too, as the prices are already on the verge of 4-5 dollars or more. And now, we have to wonder again, how many specialty stores are still run in the Big Apple? I think Jim Hanley's Universe, which I once visited back in 2003, is still in business, but they moved away from the location they once had across from the Empire State Building, and I'm not sure where they're at now. If nearly all specialty stores in NYC close down, due to high rental fees and plummeting customer visits, that'll be a significant blow to the industry, since NYC is - or used to be - such a prominent business hub, comics included. And working in Los Angeles as part of the movie business isn't saving it either. [Jon] Engel works for Todd McDevitt, and the two of them talked about starting a comicon when Wizard World Pittsburgh ended. He's doing the right thing there. Why, if the more major entertainment conventions like SDCC really don't care about the book materials anymore, then they should just stop calling themselves comic-cons and start calling/titling themselves what they're really emphasizing today - movie-cons, video game-cons, music-cons. In other words, be honest about the focus, for heaven's sake. Engel's setting a good example as somebody who admires the medium of comicdom, and I wish him and his colleagues luck in getting this convention on the road to success. Here's an article on the San Diego Union Tribune about former DC comics editor Jordan Gorfinkel's trip to the city to give a speech at a local synagogue about his new "Passover Haggadah Graphic Novel", prior to the beginning of the holiday this coming week. Nrama: So this new run starts off with Airboy #51, picking up from where you left off. What's going on in the story at this point? Dixon: At the end of Airboy #50, Davy Nelson Jr, the son of the Golden Age Airboy has been cast out of the weird, hellish dimension ruled by his arch-nemesis Misery. He’s lost somewhere on Earth and his miracle plane, Birdie, is missing as well. Valkyrie, Skywolf scan the globe for him while Airboy becomes involved in his own adventure in South Africa. This story takes place in 1989 so we’re talking apartheid. Interesting. I've got a feeling a right-winger like him could have a far better idea of how to handle a story like this than a left-winger could, so, it should prove worth reading about, and I wish him good luck in sales. The one thing the original seasons consistently dropped the ball on was LGBTQ+ representation. This struck me as sort of odd the whole time I was watching, as the rest of the show is fairly inclusive. It seemed almost to go out of its way to demonstrate heterosexuality in its protagonists as often as possible. The plot so far is intriguing and exciting, and we have gotten some fan favorite characters added to the team or showing up in cameos. It’s really good stuff so far, but I still found myself with that one pesky question: What’s with all the heterosexuality? This comes pretty close to making it sound like heterosexuality is a bad thing. How atrocious indeed. So homosexuality is "normal", but heterosexuality isn't?!? Sigh. The way these propagandists go out of their way with the "alien culture routine" is denigrating to any sane person, and that's why this dumb site is such a joke. That’s not a new question for any media, really, and it’s one that mainstream media still seems to be afraid of. It’s easy to feel exploited for entertainment when most mainstream media that’s LGBTQ+ friendly is either a dramatic foray into gay trauma or a much easier RuPaul romp through reality television. There are middle-ground stories going untold, and queer people exist everywhere in culture, not just where it makes a story more interesting. It would be refreshing to see that in superhero media, but executives insist that there isn’t any room for it. What few LGBTQ+-led comics there are get cancelled relatively quickly, and these characters’ sexualities get erased from their onscreen counterparts. It’s exhausting, and at this point, it’s just improbable. Remember that huge Young Justice cast I mentioned earlier? Some of them have to be gay; that’s just statistics. There is only so much homosexuality on display in only so many media venues today, and I'm sure the writer's aware of it too, but would rather erase everything in her pathetic display of dissatisfaction for the sake of it. She's doubtless also aware these are fictional characters, and so her approach is nothing more than comedy gold, and a perfect example of what's wrong with pop culture commentary today. Given that it’s even hinting at a budding relationship between original series regular Artemis and the father of her niece (ew), at this point, I’m really just hoping for no further weird implications about the space bug and the semi-female, semi-sentient Martian spaceship. If Outsiders tries to sell me a heterosexual spaceship, I’m going to riot. The leftist establishment's practically been shoving this stuff down the audience's collective throats for over 2 decades-plus now. Seriously, I'm sure she's aware of that too, but her LGBT-obsessed ideology leads her to pretend otherwise. But this information about the live action adaptations is telling. The Penguin's homosexual?!? Along with the 2nd Mr. Terrific? Not in the comics they weren't, as is noted in the following, and as anybody familiar with the early characterization of Montoya knows, she was not originally a lesbian, until Greg Rucka exploited her for the sake of it, because he's too lazy and pretentious to create a new character to fill that role. Heterophobia is a driving force of SJWism. Every time there is a new show or movie all you hear is that there better no romance between the male and female leads because they are pushing homosexuality. This is what happens when universities smash all this propaganda into people's heads, desensitize them to civilized values and just plain tilt them toward the abnormal in the grossest ways possible. As a result, you have all these poorly educated types going so far as to sexualize TV shows that're usually aimed at children, proving what they really think of the better interests in the young generations. And that's why the whole notion an adult would spend so much time watching cartoons is all the more disturbing. It suggests we have here a whole generation of mental adolescents who simply never grew up any more than Peter Pan, and now, look what it's led to: unfunny grown-up jokes. It's really not aimed at younger audiences, though. There's a disturbing amount of violence in the show now that's it's not restricted by a network. Halo's "deaths" got progressively more gruesome, and we actually see Vic's organs after the accident that leads to him becoming Cyborg. And the writer of the boring piece had zero issues with that, if the above is accurate? Just shows you how desensitization to violence is one of the biggest problems with how people are raised, an issue that's been around for a long time. What's really annoying is that SJWs can actually use that as justification for forcing homosexuality into these cartoons, which, depending on how jarring the violence is, aren't good for children. And the cartoon, as noted earlier, apparently changed Halo's background for change's sake. So I still don't see what's the use of a cartoon that's still been put through the PC factory, and yet didn't satisfy the social justice crowd for whom nothing is ever enough.